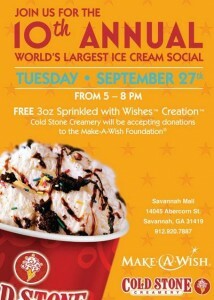 Today, 9/27 Coldstone is hosting an Ice Cream Social to support the Make-A-Wish Foundation between 5 and 8 p.m. Customers will get a free taste of their Sprinkled with Wishes Creation – Sweet Cream Ice Cream, Brownie, Rainbow Sprinkles and Fudge. You can also make a donation to the Make A Wish foundation. wish I would have known sooner, I would have gone down and got some Love Love Love this stuff.